As stated in a prior post , we promised to keep you advised of the progress of intended updates to the mortgage disclosure regulations. Due to comments from the loan industry, the effective date of the regulations was pushed back from August 1 to October 3, 2015. The delay in the implementation allowed for certain revisions to the intended regulations and allowed for the loan industry to engage in the task of preparing to close loans consistently with the new regulations. If you are applying for a residential mortgage after October 3, 2015, these revisions will apply to your loan. Within three business days after your loan application is submitted, a Loan Estimate is to be provided to the borrower. 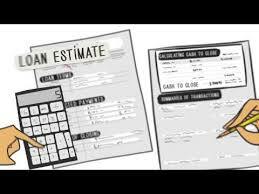 This document will provide the loan amount, interest rate, monthly payment, estimated taxes and insurance and anticipated cash required to close. The major concept behind the new regulations is that additional charges to the borrower of any type are not to be disclosed for the first time at the closing. Collection and sharing of accurate data concerning charges among those professional partners involved in the closing is crucial. Also, attorneys in New York will need to get accustomed to preparing the final financial details of closings much more in advance than is currently typical. Those attorneys who do not conduct many real estate closings may not be abreast of these developments and may not be prepared to act. The final Closing Disclosure must be delivered to the borrower at least three business days before the closing, so that comparisons can be made between the two disclosure documents. The intent is to reduce unexpected costs to which the borrower did not agree. Sellers are to be provided with a separate disclosure statement, which is not subject to the timeframe rules. The timeframes are calculated differently for the Loan Estimate and Closing Disclosure. Such calculation may depend on whether the lender is open for business on Saturdays and if a federal holiday occurs during the subject timeframe. Cooperation and coordination among all of the professionals engaged in the transaction at an early stage is required. Experienced real estate attorneys typically arrange for this on behalf of their clients. Borrowers should carefully consider whether they will seek a fixed or adjustable rate loan early in the process, so that the disclosure is accurately produced. Further, all services related to the transaction should be selected, priced and arranged early in the process. Even a quote for homeowners insurance should be obtained, so as not to require additional disclosure at a time that may hinder the scheduled closing date. Borrowers even need to think about whether a Power of Attorney will be needed for their closing, as such document has a recording fee that needs to be disclosed in advance. The reader should keep in mind that all changes to financial figures require that a new disclosure document be produced, but only some of those changes require that such document be circulated consistent with a mandatory waiting period before closing. Should a revision in the disclosure be needed, additional disclosures may need to be circulated, some of which may require additional waiting periods and a delay in the anticipated closing date. Further, borrowers should ask their attorney to obtain fees from all of the applicable parties and vendors involved in the transaction, so that disclosures are accurately and timely produced. Our attorneys recommend that their clients seek loans from some of the major national lenders while the industry adapts to these changes. In our observation, major lenders such as Chase, Citibank and Wells Fargo have been working diligently with their professional partners to make the transition as smooth as possible. Smaller regional lenders may be unprepared. The large national lenders are also more likely to prepare the disclosures, making them more likely to be accurate. In addition, our attorneys intend to request a longer period of time to obtain the loan commitment and to close the transaction. As is customary for our attorneys, such dates are calendared and monitored so that our clients do not miss any deadlines. When disclosures are not delivered in the timeframe required, mandatory waiting periods occur that may delay a closing. Mandatory waiting periods are only potentially waived for a bona fide emergency stated by the borrower, such as a potential loss of his downpayment due to a threatened time of the essence closing. Our attorneys are adept at collecting and delivering the essential financial information to all relevant professional partners, so that the closings in which they are involved are not delayed.